More Green Space in Chicago! - Chicago Botanical Garden's "Horticultural Therapy Program"
and now it's Northerly Island! They are rejuvenating the island with 400 trees and 12000 shrubs by 2017, which will add a more diverse habitat and resting spot for birds. Stotz said that Northerly Island's new look has saved the lives of countless birds. The island used to feature only dry grassland, which kept birds from landing there. Instead, they would fly from Lake Michigan into the city and often crash into McCormick Place. "Northerly Island has become an important habitat for preventing birds from hitting McCormick Place," he said. "There used to be no place to stop, and now there is." Read more about it at DNA Info article and "Northerly Island Reopens" by The Field Museum, Joshua Engel. 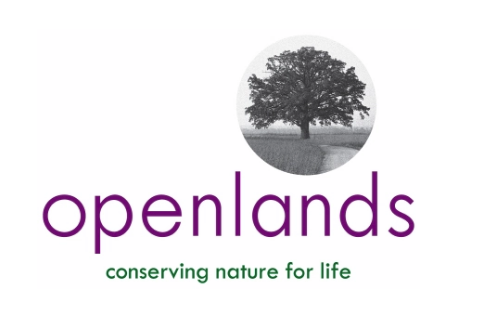 Another great organization in Chicago is Open Lands which "has helped protect more than 55,000 acres of land for public parks and forest preserves, wildlife refuges, land and water greenway corridors, urban farms, and community gardens." Currently they are working on a green vision for some empty industrial sites along Lake Calumet. Labels: Biophilic, birds, Chicago, fauna, green/blue corridors, meadow/prairie, restoration, urban forestry, visit U.S.
Hamilton’s Bobolink community is getting the boot from their current home in Greensville and being re-located to a former dump. The city is hoping that the “threatened” bird species, will feel right at home at the old Upper Ottawa Street dump. Bobolinks had been living behind Greensville Public School but their habitat has been taken away by the construction of a new Johnson Tew park and arboretum. 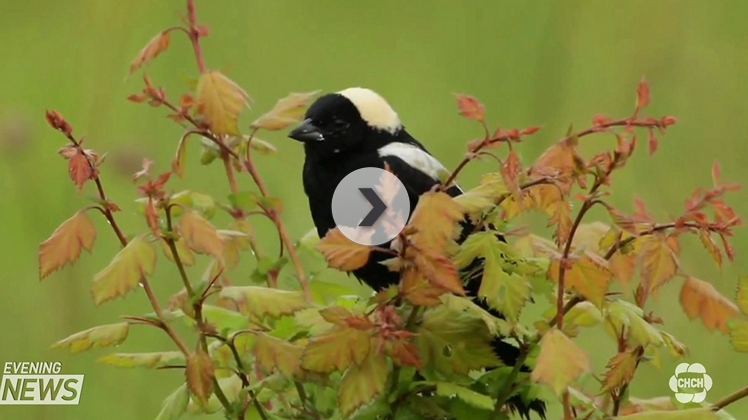 “The likelihood is that they will continue to be there until the trees start to grow up, then the Bobolink don’t like that habitat as much.” said Cynthia Graham. 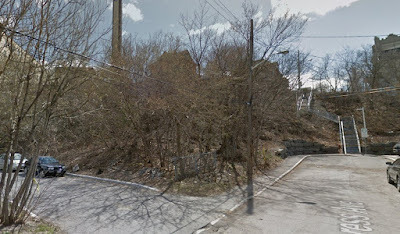 The city is hoping to entice the Bobolinks to move here, to the old Upper Ottawa Street dump, but the Bobolink is a very picky tenant, and the city will have to cut down some trees and plant prairie grasses in order for the birds to feel more at home. And the Bobolinks don’t like visitors. When they are in town, the nesting birds prefer staying on the ground in tall grass or crops. The move is estimated to cost $120 000 and another $200,000 is being requested from the city’s park project budget next year, to cover consultation with bird experts, and ongoing monitoring of the success of the project over the next 20 years. Have you seen this? Even just looking at this image makes me feel calm! 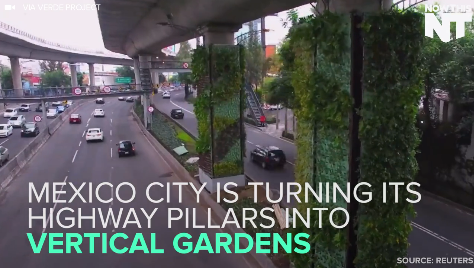 I'd love to drive on a highway like this - imagine if Toronto did this to their highway downtown! San Romanoway Revival: Greening the Corner of Jane and Finch. The Black Creek SNAP transformed underutilized spaces around the low-income apartment towers at the corner of Jane and Finch into a vibrant park, with a 63 plot allotment garden and Toronto’s largest urban orchard. The project also includes pollinator gardens, naturalization areas with hundreds of native trees and shrubs, interpretative signage and a beautiful arbour structure, designed to offer shade and harvest rainwater to support the gardens. Hundreds of volunteers participated in the development of the park. Black Creek SNAP homeowners with fruit trees have been joining forces to tend their collective urban orchard. Comprised of a very diverse group of fruit tree owners, the group meets regularly to exchange information and attend presentations led by professionals. A short term goal is for members to help one another prune trees and harvest fruit, and a long term goal is to create a social enterprise opportunity by pooling the harvested fruit and creating a Black Creek Orchard wine label, which can be sold at markets around Toronto and even beyond. On September 28 the Markham’s City Council approved the proposed design concept for Glencrest Park and endorsed it for implementation in 2015-2016. The updated Glencrest Park will include a modern playground and a shade structure near the entrance to the park at Ladyslipper Court and amenities such as a labyrinth, a meditation garden and an open play space. A proposed trail system will connect key features within the park and will provide an off-street pedestrian linkage between Laureleaf Road and Ladyslipper Court. 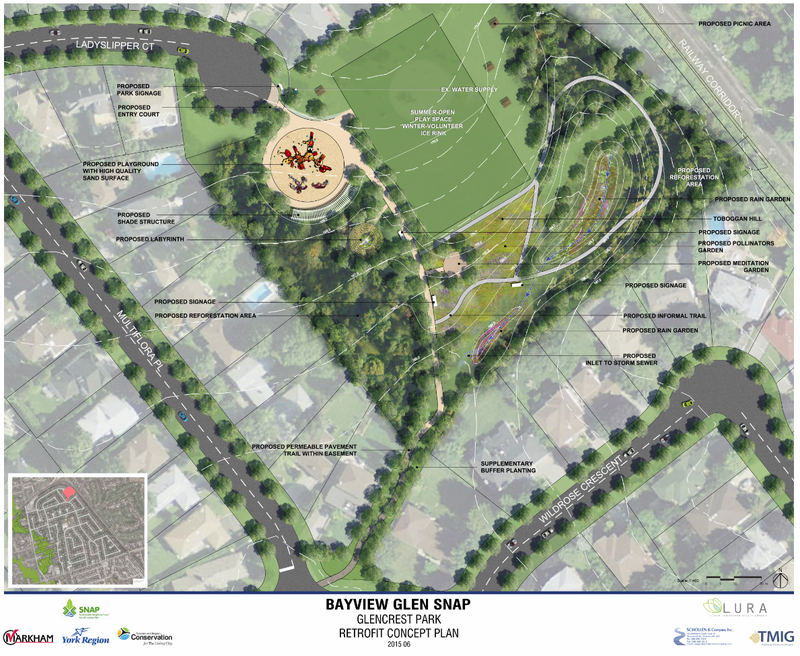 The re-creation of the valley feature with raingardens will transform the landscape within Glencrest Park from maintained turf to a rich mosaic of ecotones, creating a naturalized landscape and supporting the attenuation of stormwater runoff. A looped trail system of approximately 600 m surrounding the raingardens and the mediation garden will afford opportunities for walking and jogging within a naturalized landscape setting. Tree planting is proposed extensively throughout the park with the intent of expanding the tree canopy and promoting evapotranspiration. Glencrest Park has received a $60,000 grant from the RBC Blue Water Project. 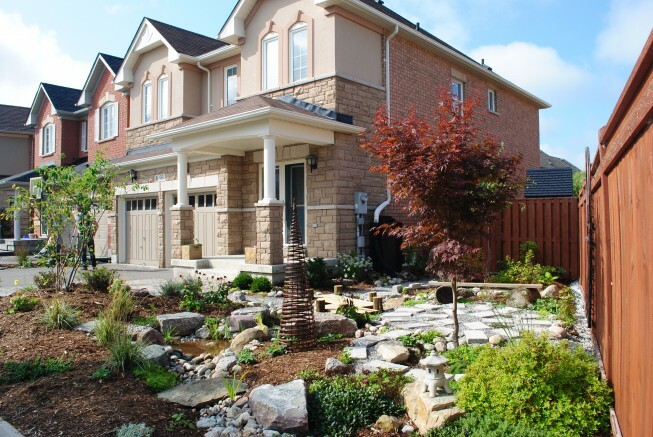 This grant will support the implementation of the raingardens and tree planting and creation of a naturalized landscape that enhances the evapotranspiration and infiltration of stormwater. Chimney Swift population decline is not due to lost habitat. 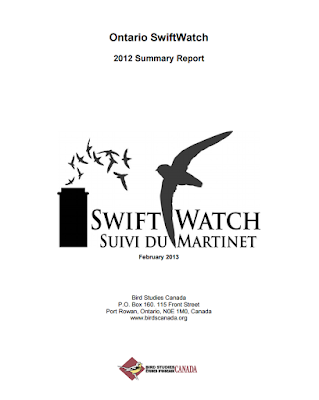 Just came across this Chimney Swift study "Swift Watch - Summery Report" published in 2012. It has some great findings about the preference of Chimney Swift habitat and the availability in Ontario urban cities. "These descriptions revealed that Chimney Swifts preferentially used chimneys with a greater length exposed above the roofline of the building and a greater inside area than those available to be used. The average chimney used by swifts extended 2.86 m above the roofline and had an internal area of 1.0079 m2. We also found that 73% of active chimneys were found on non-residential buildings. Interestingly, the majority of building types surveyed by volunteers were residential houses (63%), followed by commercial buildings. However, the building types with the highest number of sites occupied by swifts were commercial (mostly found in downtown urban habitat), churches and schools. 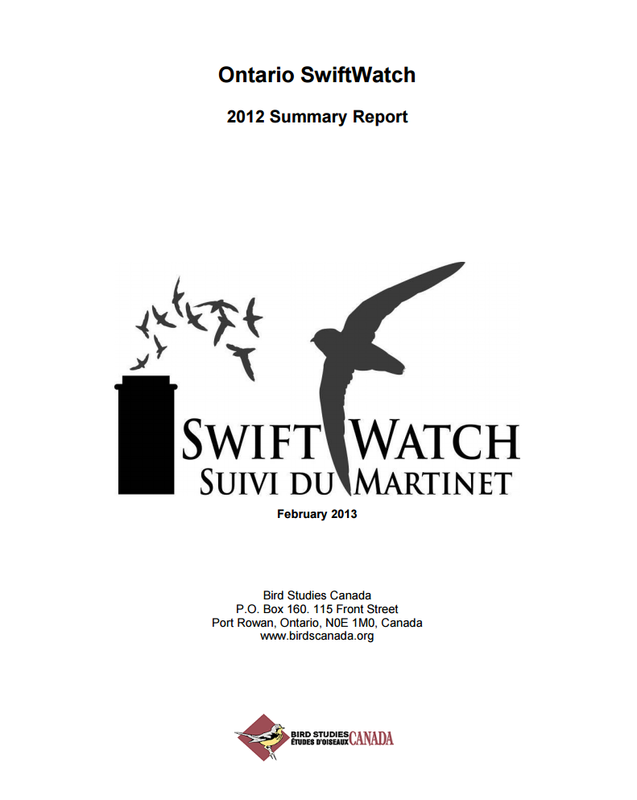 ... We found that among 139 open and suitable habitat chimneys available, only 24.4% were actually occupied by swifts. These results suggest that in urban areas there is more nesting habitat available than being used by Chimney Swifts and it is likely that declines in Ontario’s swift population are primarily driven by a process other than habitat loss, such as prey abundance and availability." They also did a study on natural nesting sites in both logged and unlogged areas in Ontario. It would be great to know more about the study area (is it in Southern Ontario or Northern Ontario?) and whether there are preferred spots and distances away from cities where Chimney Swifts choose these sites. I've never read about chimney swifts nesting in anything other than chimneys! "Deciduous trees hosted 24 used sites, whereas 17 used sites were in coniferous trees. The most commonly encountered tree species to host nesting or roosting Chimney Swift were: white pine, sycamore, yellow birch, and cypress. In three reports, the entrance used by the Chimney Swifts was an entrance previously created by Pileated Woodpeckers." "NOVA SCOTIA NATURALLY: The world of spectacular swifts"
written by Donna Crossland published on July 19, 2015 in the Chronicle Herald. 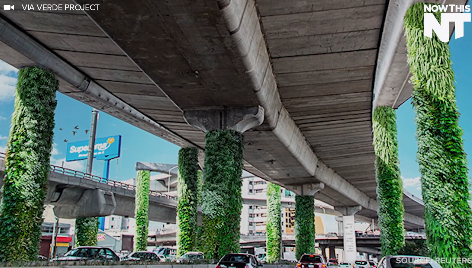 What about creating an urban forest overnight? 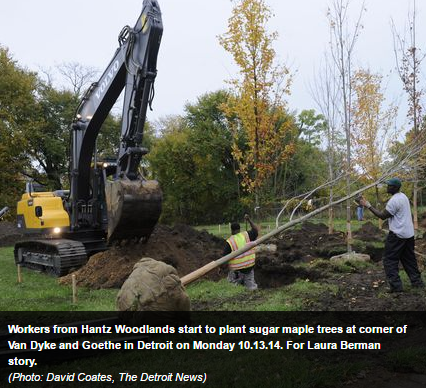 "This week, 150 mature trees — 20 feet high, trucked to Detroit from as far away as Buffalo, N.Y. — are being planted at Van Dyke and Goethe on vacant lots. They add heft and height to John Hantz's big idea: That reclaiming land for agriculture or trees will help restore pride and beauty to an area that's been demoralized by abandonment." 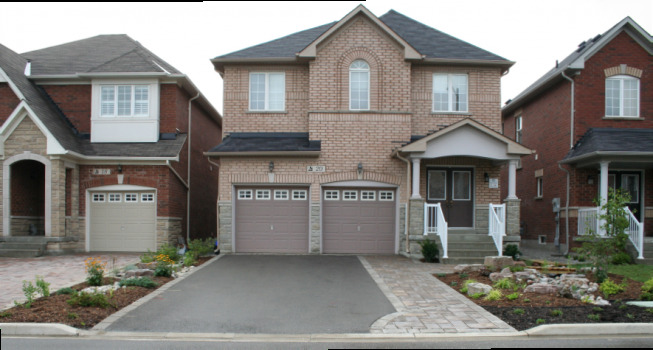 Here are two views of before (2011) and after (2015). It'll be great to continue to monitor this urban forest! Plus: read these other posts about the urban ecology opportunities for Detroit streams called daylighting (for Michigan urban waterways)! Labels: connection, ecosystem services, flora, urban forestry, visit U.S. Here's a starter list of urban ecology centres: some are run by the city, some are non-profits, some are research centres. Some implement public education programs, some run environmental remediation programs and other are studying (with the help of students or citizen volunteers) urban ecological issues. Share with me others that you know of! P.S. 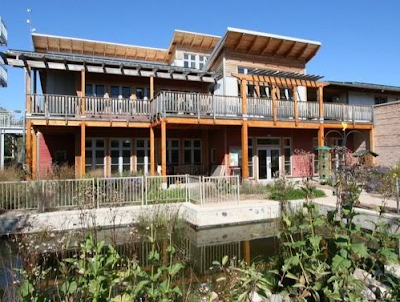 I also wrote about Debs Park in Los Angeles which is another great example of an urban ecology centre! Labels: Canadian project, UEC, visit Canada, visit U.S.
Two Front Yard Makeover demonstration projects were installed in July-September 2012. These projects play an essential role in communicating the objectives of SNAP and profiling many of the key practices of residential eco-landscaping. Regarding the new gardens - noted comment from a neighbour was ‘Environmentally friendly garden yet artistic and multi-use’. Both watered, on average, once a week using only water from the rain barrel, no potable water was used. Neither design includes a lawn, thus both time and water were saved. 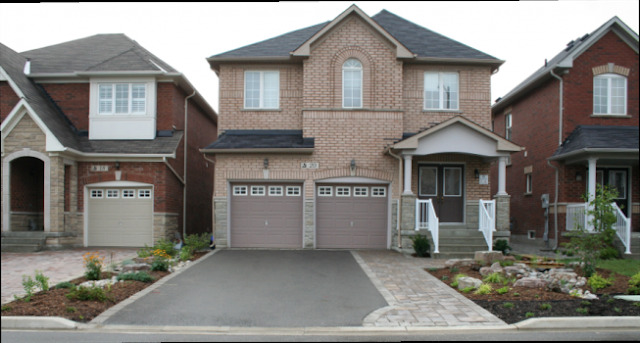 Roof leader discharges to a bioswale or soak away underlain with AquaBlox units. Discharge of another roof leader into a rain barrel with overflow directed to a dry river bed that leads to a soakaway or rain garden. Discharge of a third downspout onto a permeable driveway/walkway. Water efficient native plantings of trees, shrubs and plants. 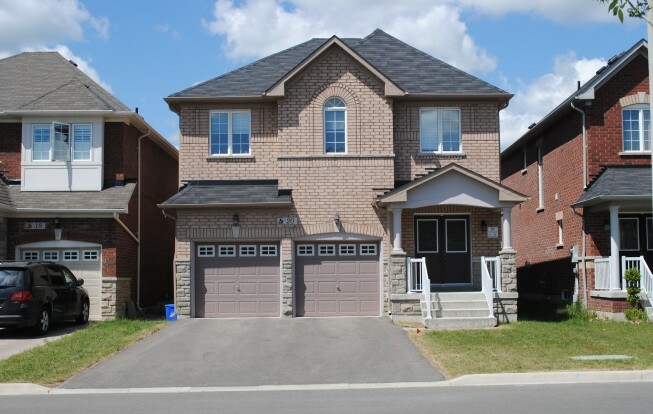 Link to SNAP Lake Wilcox Project Page. Finally after fifty or more years, Lebreton Flats is being redeveloped. 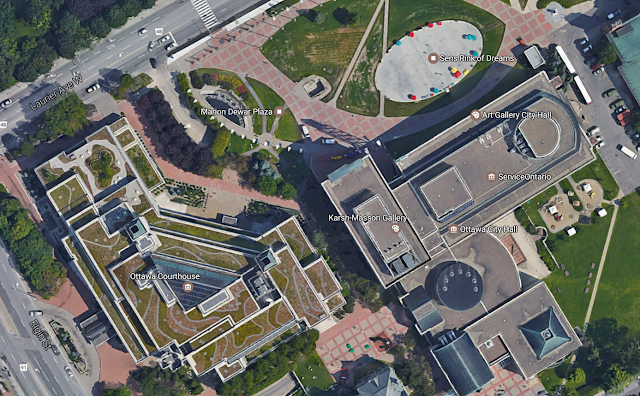 I've always wondered about the area and all that green space so close to the urban core. When I was thinking how great it would be for the city to have an Urban Ecology Centre centrally located (when I started my new career in 2011) I thought something off of Bayview would be perfect. It would be close to the river, along a major corridor (that fauna may naturally follow) and there was all that open green area. Just a beautiful spot and vista. I started thinking about this area again today when my friend posted about seeing an urban fox in Chinatown. 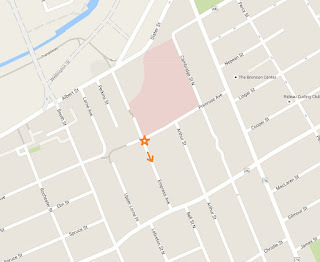 "We just saw a fox trotting at a fast clip around Primrose and Empress in Ottawa's Chinatown tonight. It looked she/he was heading towards Somerset before he/she ducked between some buildings. 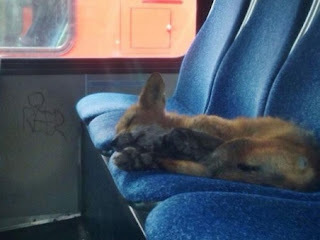 Who knew we'd find a fox in Centretown?" It would be an amazing sight to see in the evening. On the Urban Wild Walks we were told that there was a fox denning in the Macoun Marsh area (which my spouse saw this week cross St. Laurent late in the evening) and our Animal Tracks tour leader also found a fox den (although empty at the time) up in Rockcliffe Park (the official park where the pavilion is, not the neighborhood "Rockcliffe Park"). But are urban foxes common in Canada? I knew they were in parts of the U.K. as I have read and watched documentaries on London's urban foxes. London has no urban raccoon or skunk population (unlike here in Canada) but it does have increasing numbers of badgers, weasels, hedgehogs and other small nocturnal visitors. Each creature has different territory size and the overlap of these territories may vary along with when each is on the prowl. But back to Ottawa - pictured above and below are the areas that connect Lebreton Flats area to Chinatown (above the ridge) along Empress and Lorne. There is a very scrubby areas along the ridge in both places which could offer urban mammals including foxes some cover and some easy accessible corridors to explore more urban territories above the ridge. The pink area in the map below is the Saint Vincent hospital property and Somerset is south of this site. The orange arrow pointing in the direction the fox was going. 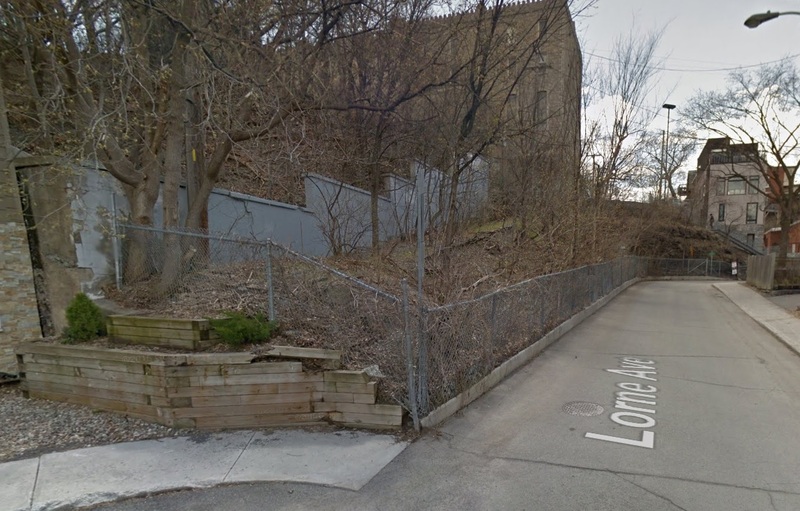 Lebreton Flats (before current redevelopment started) had some great wild green and rocky areas that could offer den locations. The fox at Macoun Marsh is found in the rocky area beside the marsh. The den in Rockcliffe Park was dug in soil along the slopes down to the river. Red foxes are a rare sighting but part of the reason for this is that we keep different hours. Foxes are nocturnal like our skunk and raccoon neighbours but this still doesn't explain why they are rarely spotted here as I've definitely seen the other two creatures from time to time, so why not foxes? They have been seen in the Fletcher Wildlife Gardens and the volunteers there estimate that there is just one family that uses the territory. FWG's webpage indicates that despite being nocturnal, foxes will hunt during the day in the winter but this area with its fields, shrubs and woods is very different than an urban landscape. I'm guessing that urban scavenging is still best done at night when the city is more quiet. Foxes are solitary and, even in areas where they are known to dwell, are rarely spotted. The Toronto Wildife Centre states that foxes are more common than realized and can be found near ravine systems, large grassy fields and large parks where small mammals are plentiful (Toronto Wildlife Centre) and the MNR backgrounder states that foxes do den near human areas and are commonly found in many large urban centres in Ontario. Charlottetown, however is one Canadian city where fox populations are similar to the London U.K. situation where "human-fox interactions are commonplace". An urban research team studying these foxes "found 89 dens in Charlottetown". (Saltscapes) Many residents of this city have spotted foxes - they have become a common sight unlike cities here in Ontario. So my conclusion would be that they are more common than we realize but not as common as raccoons and skunks, which is probably a good thing! Foxes can travel up to 10 km a day. (Lethbridge College, Virtual Wildlife Project - Hubbard Collection) It's 4 km from Lebreton Flats to the Fletcher Wildlife Garden. 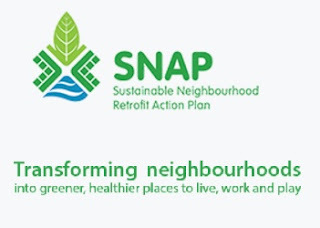 In partnership with local stakeholders including residents, businesses, local groups and institutions, the project seeks to develop action plans to improve the local environment on the neighbourhood scale and build resiliency against climate change by greening local infrastructure and encouraging positive behavior changes among residents. 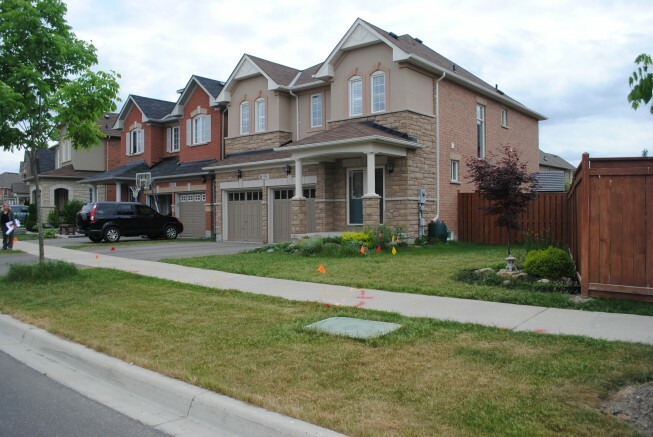 Based on existing conditions of each neighbourhood the project sets neighbourhood-level targets and identifies key actions on private and public property to address environmental objectives in the context of social and economic considerations for each neighbourhood. Each plan builds the business case for implementation by measuring individual and community benefits and cost savings.